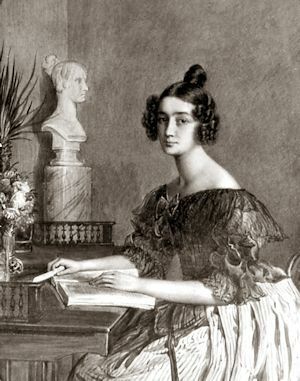 Sophie La Trobe was the daughter of Frédéric-August de Montmollin and Rose Augustine, née de Meuron, members of two prominent patrician families in the canton of Neuchâtel, on the French border of Switzerland. She was born in 1810, the eighth of the Montmollin’s thirteen children, and lived with her parents and siblings in Neuchâtel until she married Charles Joseph La Trobe in nearby Berne in 1835. They had met when La Trobe was engaged as mentor to one of her young cousins, Albert de Pourtalès. Their honeymoon was spent at Jolimont, a manor house belonging to her uncle Comte Frédéric de Pourtalès, overlooking the scenic Lake of Bienne. Sophie has been described as having a fine character and a loving heart; of being refined, gentle, sincerely religious, affectionate and devoted. 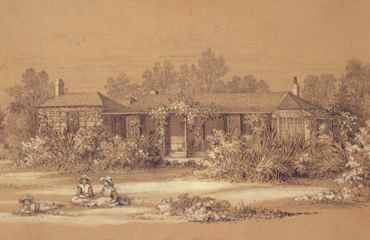 She did not enjoy good health and suffered from frequent neuralgic headaches that led her to prefer a quiet family life at her modest yet elegant home, Jolimont in Melbourne, in preference to travelling with her husband around the District of Port Phillip where they came to live in 1839. In Melbourne Sophie had a small circle of friends who consisted largely of the wives of clergymen and professional men, many with squatting interests. For a few years in the middle 1840s she spent the hot summer months at Shortland’s Bluff, later renamed Queenscliff. Four children were born of the marriage: Agnes in April 1837 in Neuchâtel, followed by three siblings born in Melbourne, namely Eleanora in March 1842, Cécile in June 1843 and Charles Albert in December 1845. Education of the children was of constant concern to Sophie, and eventually Agnes, aged eight, was sent home to the extended family in Switzerland to be educated. Letters written to Agnes over the following years are a valuable source of information about the La Trobes’ family life at that time. Marguerite Hancock, ‘The Life of Sophie La Trobe’, La Trobeana, Vol 9, No 3, November 2010, pp. 17-21. Dianne Reilly, ‘An Anglo-Swiss Alliance: the marriage of Charles Joseph La Trobe and Sophie de Montmollin of Neuchâtel’, La Trobeana Vo,l 12, No 2, July 2013, pp.19-24. Patrick Gregory, ‘Dear Jolimont: a narrative’, La Trobeana, Vol 13, No 1, March 2014, pp.30-35.